Why play at Betfair Poker? 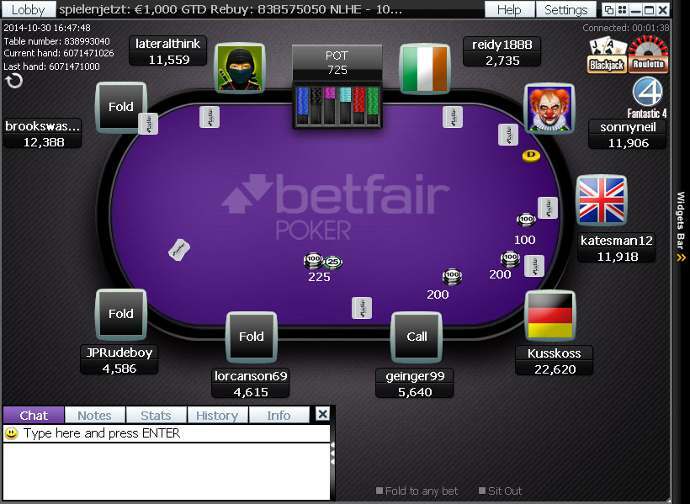 Betfair Poker is an internationally renowned brand offering plenty of attractive promotions, especially for VIPs. Betfair is first and foremost known as the world's largest betting exchange, with more than 1.1 million active customers per year. Betfair's poker branch is hosted on the iPoker network, the biggest poker network, offering plenty of cash game and tournament action. Betfair is the world's largest betting exchange with over 1 million active customers per year, a lot of whom regularly find their way to the poker tables. So at Betfair Poker you will find online poker tournaments with big guaranteed prizepools, tournament series like iPOPS and action packed cash game tables with relatively loose and aggressive opponents. Twister Poker jackpot Sit & Go's and speed poker are amongst the most popular poker games at Betfair Poker. On top of the highest available welcome bonus on Betfair Poker, there are more advantages for you as a player from PokerStrategy.com. You receive 3 StrategyPoints for every $1 you rake at Betfair Poker. Betfair is based in the UK, and has multiple licenses, including a license from the Gibraltar Gambling Commission, and the UK Gambling Commission. Betfair Poker offers a lot of regular attractive promotions, which also reward low and high volume players, like special rake races and raked hands chases. On top you automatically have access to several daily and monthly freeroll tournaments.